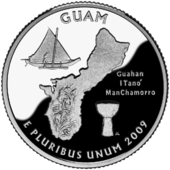 Guam ( i/ˈɡwɑːm/ or /ˈɡwɒm/; Chamorro: Guåhån) is an organized, unincorporated territory of the United States in the western Pacific Ocean. 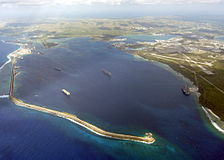 It is one of five U.S. territories with an established civilian government. The island's capital is Hagåtña (formerly rendered Agana). 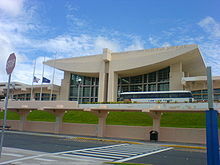 Guam is the largest and southernmost of the Mariana Islands, and the largest island in Micronesia. Spanish colonization commenced on June 15, 1668 with the arrival of Diego Luis de San Vitores and Pedro Calungsod, who established the first Catholic church. :64 The islands were part of the Spanish East Indies governed from the Philippines, which were in turn part of the Viceroyalty of New Spain based in Mexico City. Other reminiscences of colonial times include the old Governor's Palace in Plaza de España and the Spanish Bridge, both in Hagatña. Guam's Cathedral Dulce Nombre de Maria was formally opened on February 2, 1669, as was the Royal College of San Juan de Letran. 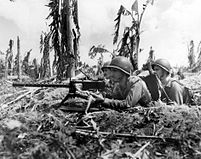 :68 Guam, along with the rest of the Mariana and Caroline Islands, were treated as part of Spain's colony in the Philippines. While Guam's Chamorro culture has indigenous roots, the cultures of both Guam and the Northern Marianas have many similarities with Spanish and Mexican culture due to three centuries of Spanish rule. 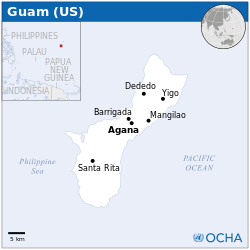 Guam lies between 13.2°N and 13.7°N and between 144.6°E and 145.0°E, and has an area of 212 square miles (549 km2), making it the 32nd largest island of the United States. 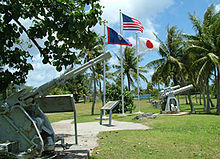 It is the southernmost and largest island in the Mariana island chain and is also the largest island in Micronesia. This island chain was created by the colliding Pacific and Philippine Sea tectonic plates. Guam is the closest land mass to the Mariana Trench, a deep subduction zone, that lies beside the island chain to the east. Challenger Deep, the deepest surveyed point in the Oceans, is southwest of Guam at 35,797 feet (10,911 meters) deep. 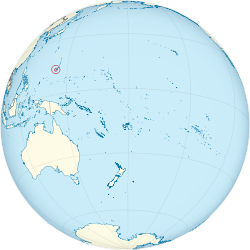 The highest point in Guam is Mount Lamlam at an elevation of 1,334 feet (407 meters). 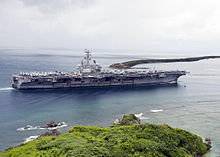 The island of Guam is 30 miles (50 km) long and 4 to 12 miles (6 to 19 km) wide, 3⁄4 the size of Singapore. The island experiences occasional earthquakes due to its location on the western edge of the Pacific Plate and near the Philippine Sea Plate. In recent years, earthquakes with epicenters near Guam have had magnitudes ranging from 5.0 to 8.7. Unlike the Anatahan volcano in the Northern Mariana Islands, Guam is not volcanically active. 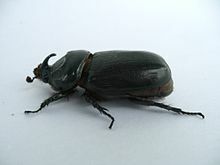 However, due to its proximity to Anatahan, vog (i.e. volcanic smog) does occasionally affect Guam. 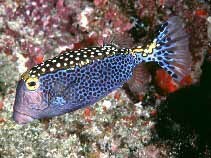 A coral table reef surrounds most of Guam, and the limestone plateau provide the source for most of the island's fresh water. Steep coastal cliffs dominate the north, while the southern end of the island is mountainous, with lower hills in between. 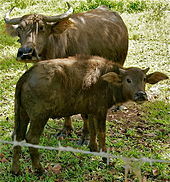 Guam's climate is characterized as tropical marine moderated by seasonal northeast trade winds. The weather is generally very warm and humid with little seasonal temperature variation. The mean high temperature is 86 °F (30 °C) and mean low is 76 °F (24 °C) with an average annual rainfall of 96 inches (2,180 mm). The dry season runs from December through June. The remaining months (July through November) constitute the rainy season. The months of January and February are considered the coolest months of the year with overnight low temperatures of 70–75 °F (21–24 °C) and low humidity levels. 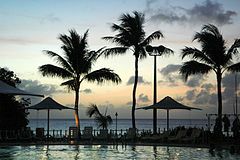 The highest temperature ever recorded in Guam was 96 °F (36 °C) on April 18, 1971 and April 1, 1990, and the lowest temperature ever recorded was 65 °F (18 °C) on February 8, 1973. Based on a 2010 estimate, the largest ethnic group are the native Chamorros, accounting for 37.3% of the total population. Other significant ethnic groups include those of Filipino (26.3%), White (7.1%), and Chuukese (7%) ethnicities. The rest are from other Pacific Islands or of Asian ancestry. Roman Catholicism is the predominant religion, with 85% of the population stating an affiliation with it. A small Jewish community exists as well. Guam is also a major hub for submarine cables between the Western U.S., Hawaii, Australia and Asia. Guam currently serves 12 submarine cables, with most continuing to China. Believed to be a stowaway on a U.S. military transport near the end of World War II, the brown tree snake (Boiga irregularis) was accidentally introduced to Guam, that previously had no native species of snake. It nearly eliminated the native bird population. The problem was exacerbated because the reptile has no natural predators on the island. The brown tree snake, known locally as the kulebla, is native to northern and eastern coasts of Australia, Papua New Guinea, and the Solomon Islands. 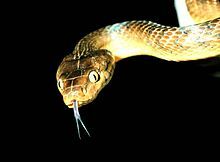 While slightly venomous, the snake is relatively harmless to human beings. Although some studies have suggested a high density of these serpents on Guam, residents rarely see the nocturnal creatures. The United States Department of Agriculture has trained detector dogs to keep the snakes out of the island's cargo flow. The United States Geological Survey also has dogs capable of detecting snakes in forested environments around the region's islands. 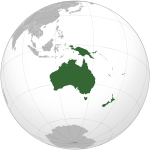 ^ a b c d e "Australia-Oceania :: Guam (Territory of the US)". The World Factbook. Central Intelligence Agency. Retrieved 26 August 2015. ^ Rodda, Gordon H.; Fritts, Thomas H. (1992). "The Impact of the Introduction of the Colubrid Snake Boiga irregularis on Guam's Lizards". Journal of Herpetology 26 (2): 166–174. doi:10.2307/1564858. JSTOR 1564858. ^ Rogers, H.; Hille Ris Lambers, J.; Miller, R.; Tewksbury, J. J. (2012). Siepielski, Adam, ed. "'Natural experiment' Demonstrates Top-Down Control of Spiders by Birds on a Landscape Level". PLoS ONE 7 (9): e43446. doi:10.1371/journal.pone.0043446. PMC 3436874. PMID 22970126. ^ Hodgson, R. A. J.; Wall, G. C.; Randles, J. W. (1998). "Specific Identification of Coconut Tinangaja Viroid for Differential Field Diagnosis of Viroids in Coconut Palm" (PDF). Phytopathology 88 (8): 774–781. doi:10.1094/PHYTO.1998.88.8.774. PMID 18944882. Archived from the original (PDF) on June 14, 2007. Retrieved June 16, 2007. This page was last modified on 29 August 2015, at 20:42.